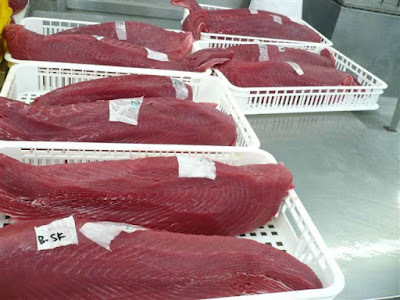 Tuna loin bigeye and yellowfin are usually used interchangeably depending on which one of them is available in local market right now. 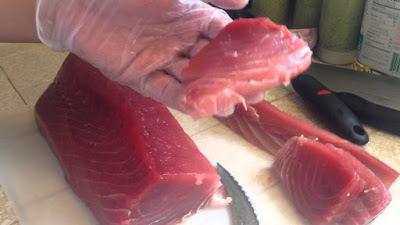 The tuna loin itself often used for sushi dish such as nigiri or sashimi, and other raw fish dishes. As for the tuna bigeye, it is one particular tuna species that often become favourite fish of many chefs due to the nice texture, taste/ flavor, and a lot of flesh with few bones. Bigeye is also considered as premium fish meat for sashimi, easy to be cooked, and appear brilliantly in many dishes. This is why the Bigeye tuna loin is often used as the center piece of many dishes. 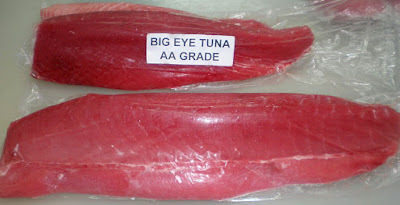 Replace your cow or chicken meats with tuna loin bigeye today! If you have a diet full of cow and chicken meats then it is the time you considerate to replace them with some beautiful tuna loin bigeye which in fact, also healthier. The tuna meats have thick and firm texture with mild fishy flavor so if you never taste a fish because you dislike the fishy smell then you will be just fine when you go with yellowfin and bigeye tuna. Bigeye and yellowfin tuna are good substitute for meats. They are less in unsaturated fats and they also have more protein. Not to mention they have fewer calories and this is why you better select tuna meat rather than meats. The best advantage to replace the meats with tuna fish loin is that you can get omega-3 nutrition benefits for your body. For your information, our body cannot produce this fat and this is why we need outside source just to fulfill the need of omega-3 for our body. Omega-3 fats can be found in tuna product in such high level. Although we understand, many tuna loin bigeye supplier also sell omega-3 fatty acids in the form of fish oil, however having the omega-3 in the most natural way still the best thing to do. Omega-3 is good for your heart and it can help to lower the risk of cardiovascular disease. Omega-3 along with minerals and proteins as well as vitamins in tuna can boost your immune system; body metabolism, brain function, and fight against free radicals affect meaning that it can reduce the risk for you to have certain cancers. Free radicals are often linked to cancers and other dangerous diseases. Just like when you cook certain meats, tuna fish in loin shape can be cooked into many healthier dishes. You can eat them raw as sushi dishes or you can simply slice or cut them into steaks and then grill them with additional seasonings. Other popular methods to prepare edible tuna loin are by pan frying, smoking, barbequing, baking, marinating, and poaching. Barbecued or grilled, you can leave the tuna meats seared and rare centrally. You can marinate the tuna as well to add more flavors, for example salt, vinegar, pepper, olive oil dressings, eggplant, and many more. Japanese people love to have bigeye tuna loin raw or seared and the serve with wasabi and Japanese soy sauce. Alternatively, you can prepare the tuna loin meat by baking it and add herbed crust to add flavor plus prevent the meat drying out. 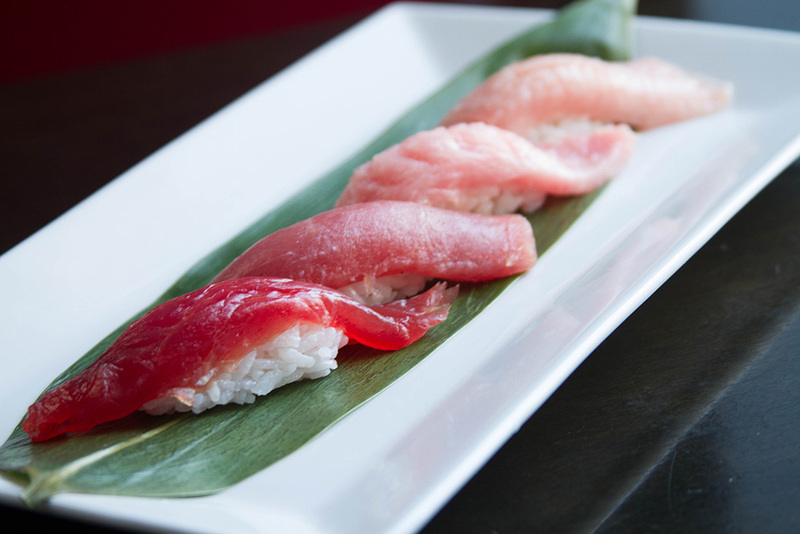 Despite being expensive, many professional chefs prefer bigeye or yellowfin tuna loin to serve sushi or sashimi. However, if you want to cook it, you can sear the meat in hot pan and be careful to not overcook the tuna fish. Thanks to the high fat content, tuna bigeye loin and yellowfin tuna are really ideal for roasting, grilling, and pan searing. The advantages for having yellowfin or bigeye tuna are that they are available all year round. They are abundant and can be found easily to substitute rare tuna fish. Moreover, tuna loin is the best qualities of tuna products, the loin is the greatest tuna cut compared with tuna steaks or other tuna products. Sometime tuna loin bigeye suppliers love to offer the most delicious taste parts of the tuna and you can also custom order from them to get the best cuts. Tuna loin is usually graded based on their qualities which can be seen from their texture, color, smell, and overall appearance. This is some suppliers will done anything to make the loin looks good, even when they need to use carbon monoxide or CO2 to treat the meat. This particular process can make the tuna appear fresh again, however in several countries; such treatment is illegal because it is unhealthy so you need to be careful when choosing the tuna loin or other tuna fish meats. When the tuna fish meat looks abused, the CO2 can be used to improve the color of the tuna meats especially the lower grade of bigeye tuna. Thanks that fresh bigeye steaks and loins are rarely treated by CO2 to improve or maintain the color. But you still need to pay attention when buying the tuna loin products in your local markets. There are several downside of the bigeye tuna loin which you may need to know. First, the price is really expensive compared with other tuna products. This is because tuna in loin is the highest qualities of tuna cuts. Second, the shelf life of the bigeye tuna might be shorter than other tuna fishes. 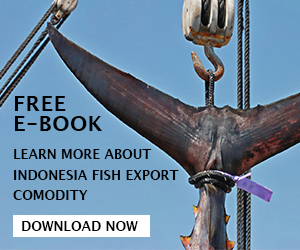 This is can be affected by the quality of bigeye tuna fish that are caught by pole and line since they can suffer from tuna burn when they are struggle at getting caught and in the end resulted in the tuna fish having a shorter shelf life. 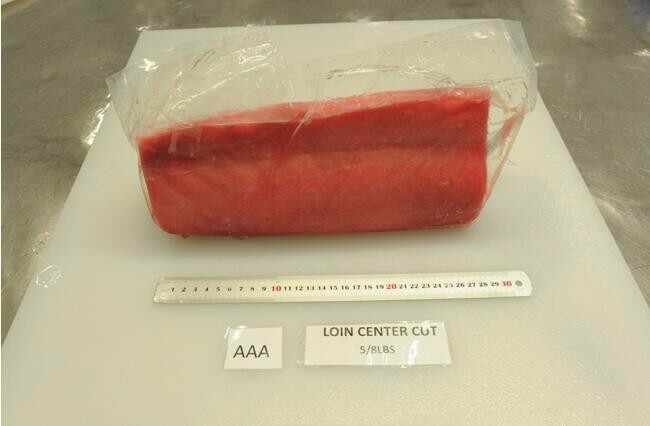 Those are some important information which you need to know about tuna loin bigeye species. 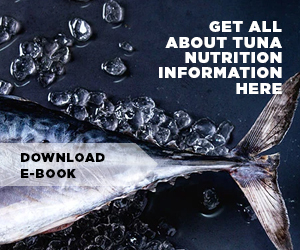 If you have more questions regarding tuna bigeye or other species of tuna then do not hesitate to comment in this post. You can also share your thought about tuna fish and its products.